Life in Japan – or any foreign country – is an exciting challenge. It may also prove to be overwhelming at times. At Motivist Japan, we are here to help you each step of the way, be it for paperwork or simply things about your daily life. We do not let you down once you are in Japan. But here are various advice beforehand, about life in Japan. Try to make Japanese friends (not only fellow foreign students)! For information about Healthcare insurance, please click here. If you would like to be covered for injuries or damages caused to others, you need to subscribe to a private personal liability insurance. This should be the last of your concerns as Japan is one of the safest countries in the world! You do not need to take any specific safety precautions in Japan. You can find “Koban” (Police stations) near most train stations, notably. Most streets are safe, even in the middle of the night. If need be, you may contact your diplomatic mission. 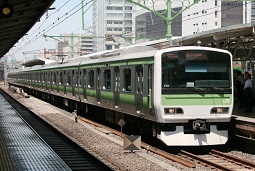 The transportation system in Japan is excellent. All types of public transportation are very reliable and punctual. In big cities, you will find the Trains (JR)/Metro network very dense. Trains are very convenient – though you may want to avoid rushing hours. The bus system in big and small cities is reliable as well. And you can easily hop in a taxi if necessary. 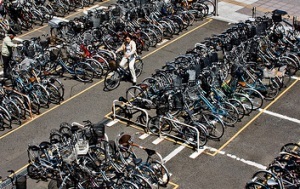 Japanese use bicycles a lot. For small distances, this is the most used means of transportation. When you want to travel around, you may also use the railways. The Shinkansen is not only fast but very comfortable. It will take you anywhere in Japan. 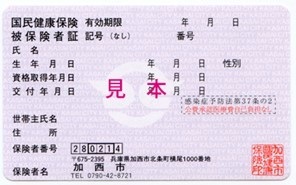 If you intend to travel a lot inside Japan, you may want to consider buying a pass (“Japan Rail Pass“) (only under certain conditions, not for long term stays). Ask for information at your train station. Japanese also use airplanes for domestic travels. You may want to consider that if you need to travel a long distance as it may actually be cheaper than Shinkansen. 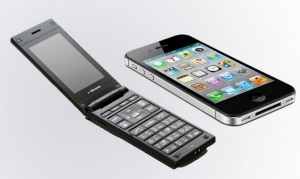 One of the first things you will need to do in Japan is get a keitai (mobile phone). For short-term stays, we advise you to get a prepaid phone (see below “Having a mobile phone”). At your place – be it homestay, a dormitory or an apartment – you will have Wifi for free. The Japanese Post offices are very reliable. They usually open from 9am to 5pm, Monday through Friday. They offer quick and professional service (as is commonly done in Japan). For more information about Leisure in Japan, please click here. 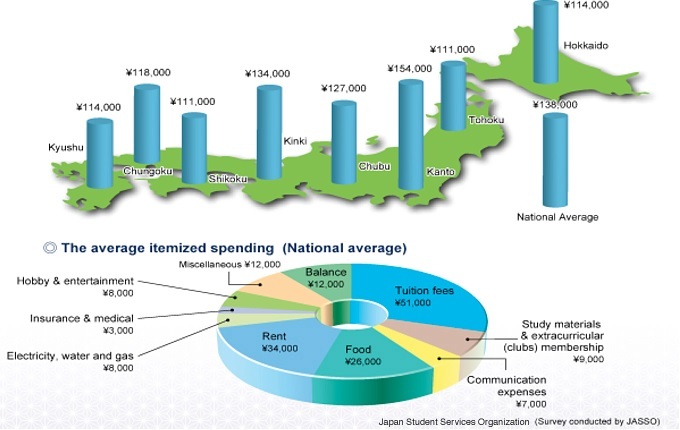 It is a cliche to say that cost of living in Japan is expensive. One must simply be smart to find the right places to shop in. 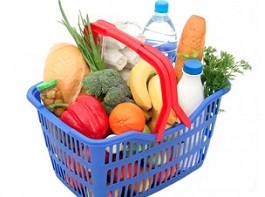 You will get accustomed quickly to your surroundings and find out where to find what and for what price. You may enjoy the 100 Yen shops (Cando, Daiso …) which you can see all over the country. You can find almost everything there. If you are on a budget constraint, expect to spend a lot of time (and, eventually, money) shopping there! Japanese people usually pay by cash. Most banks provide foreign currency exchange but that can prove costly and, even though Japan is a very safe country, you may want to avoid carrying around too much cash. Therefore, in order to make your life easier in Japan, we recommend that you own a card which you can use in most ATMs and thus open a bank account. 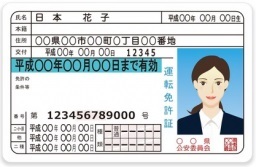 Indeed, card issued abroad would not work in most AMTs in Japan. . If possible – especially if you intend to study in Japan for more than 3 months – we recommend that you open a bank account. It will be convenient (and less costly) to draw cash from ATMs if you have an account in a Japanese bank. Further, your monthly bills (phone, water, electricity, gas …) can be drawn directly from your account through the automatic transfer service, thus avoiding you the troubles of having to pay the bills one by one and making sure the payments are timely. 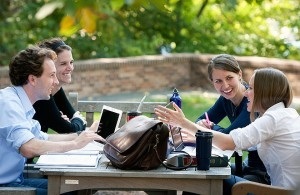 If you are awarded a scholarship, if you work part-time, that will also be quite convenient. To open a bank account, you will only need your Residence card. You may need to write your name in Katakana. Practice before you go to the bank, or ask help from a teacher or a friend! You may also be asked to use your Hanko (personal seal). You can have your hanko made in a hanko shop, for less than 1,500 Yens. In department stores, you may also find machines that make hankos. For information about working in Japan, please click here. Life in Japan requires a certain discipline. Following customs and rules is the first step to integration. Just like anywhere in the world, it is very important to follow the rules. That applies always and anywhere in Japan, starting with the lodging. For example, you need to be vigilant and not make noise in the late hours. Usually after 10pm, people living in shared facilities refrain from using the vacuum cleaner and laundry machine. Consideration of others and common sense will just have to be used. If you run into trouble, confer with someone at your school. In Japan, people separate trash into different bins, which are collected on fixed days. Combustible: food garbage, paper, sanitary items … You have to buy the trash bags designated by city government at the shops. Collections usually occur twice (or three times) a week. There may be a day for collection of papers and cartons. Non-combustible: plastic, glass items, cans … Hazardous products should be disposed in transparent bags in order for the trash collectors to identify them properly. Collection is once a week in most areas. Large items: to dispose of large items, you must first call the Sanitary Office. You will be charged a small fee. People must keep the facilities clean at all time and share the chores. At work too, often time is devoted to cleaning the office before the start of the working day. In fact, Japanese children learn that, starting at the elementary schools, where the pupils are in charge of cleaning the restrooms. While living in Japan, you will quickly find out that bicycling is the best way to go! At the bicycle shop, you will get the registration for your new bicycle. If you buy it secondhand, make sure you receive a certificate of transfer, to be submitted to your local Police Station. Do not park you bicycle anywhere. There are parking spaces designated for bicycles. Some places are free, others do not charge for the first couple of hours. Subsequent fee may be 100 yens per hours. If you do not park your bicycle properly, it may be confiscated by municipality officers. You would then have to pay a fine in order to recover it. When leaving your rented place before the lease term, you must let the landlord know at least one month in advance. Make sure that the utilities (water, electricity, gas) are taken care of: contact each company a few days before leaving. Appointment will be made for them to come to your place for the last payment. Before returning the keys, your landlord will check the state of the apartment. If it is clean and not damaged, your deposit will be returned to you. If you are moving to another place in Japan, you need to go to the Post Office to advise them on the change of address. This way, the mail addressed to you in your old address will be re-forwarded to your new one. You are not required to take either the written test or road test to convert your license, if your license was issued and you can prove residency in following countries (see the list below) for a minimum of 3-months after license issuance. Austria, Belgium, Czech Republic, Denmark, Finland, France, Germany, Greece, Iceland, Ireland, Italy, Luxembourg, Monaco, Norway, Portugal, Slovenia, Spain, Sweden, Switzerland, The Netherlands, The United Kingdom, Australia, New Zealand, Canada, Taiwan and South Korea. The procedure involves submitting certain documents to determine your eligibility. Once they are approved there will be a vision and color recognition check. A valid driver license from one of the above countries. Registered as a foreign resident at local city or ward office. After your documents are verified and approved, and you have passed the eye test your driving license will be issued. Written and driving test necessary for foreign residence hold a valid driver’s license from a country other than those above and can prove a minimum of 3-months residency in the country that issued. The procedure involves submitting certain documents to determine your eligibility. Once they are approved there will be a vision and color recognition check, after which there will be exams to test your knowledge of the driving rules and driving technique. After passing the driving test your license will be issued on the same day. No one could imagine life in Japan without a keitai. Indeed, we strongly suggest that you get a cellphone in Japan. That will enable you to easily keep touch with your friends. If you want to keep it easy, you can rent one. You may also simply use your own phone, in which case: you would need to confirm that it is 3G (or 4G) compatible in Japan, and that the international roaming charges are affordable (that’s far from sure!). If you intend to stay a long time (2 years or more) in Japan, you should consider buying one. In most cases, you will choose between a prepaid phone, and a rented one. Note that if you purchase a cell phone in Japan, it will likely not work with another carrier (abroad but maybe not even in Japan as well). Rental: This is the cheapest way to get a phone in Japan. You only need a credit card and a picture ID to rent a phone. Usually you will pay around 300 Yens per day (up to 1,500 Yens or more for smartphones), though you may have to pay 4,000 or 5,000 Yens for the first week of use. On top of that, there are charges on calling, texting etc … Incoming calls are free while outgoing calls are charged between 50 and 100 Yens per minute. Prepaid phones: The price starts at around 2,000 Yens. You can buy credits at cellphone stores or “combinis” (convenient stores). Credits are valid 60 days usually. The phone number is de-activated if you have not used the phone for 3 months to one year, depending on the company. Fares of prepaid phones are in the same range as a rental: incoming calls are free while outgoing calls are charged between 50 and 100 Yens per minute. Subscription plans: With this option, you pay for what you used, at the end of each month. You may be able to find a free phone. However, you may be asked to commit to a 2-year plan. Alternatively, you may buy the phone, in which case you just pay for the monthly usage. Try to make Japanese friends (not only fellow foreign students)! Making Japanese friends not only helps you improve your language skills, it will be a way to still connect you to Japan if/when you leave the country. It may take time to build genuine, deep friendship. But you will find out it was well worth it. Do not isolate yourself: you are in a foreign country. Make the most of it to discover a new country and culture, engage in conversations, go out, make friends and build a network. Temporarily leaving Japan: During your period of stay, if you need to leave Japan with the intent of returning, you must first apply for a re-entry permit at a Regional Immigration Bureau (unless you hold a resident card for a mid to long-term stay in Japan). Failing to do so would prevent you to re-enter Japan. You would have to apply for a new visa from a Japanese Embassy or Consulate. Extending your stay: If you would like to extend your stay beyond the period that has been granted to you, you need to contact the Regional Immigration Bureau. Bringing dependents: It is possible to bring spouses and children for a length that does not exceed the period of stay granted to the student. The dependents will then be staying under the status of “Dependent”.